There are many books on creative writing available to language arts teachers. Writers Inc and Not Just School Work can be found on the bookshelves of most English classrooms. Most of the creative writing books out there briefly discuss topics such as how to organize a paper, what a metaphor is, and how to add details to fiction and non-fiction works. Some, like the Not Just School Work Series focus primarily on writing prompts, giving children creative and fun ideas of what to write about, without going into the concept of style or technique. Most children will not grow up to become fiction authors in adulthood. However, there is a great deal to be learned from entering the world of professional fiction writing at a young age just the same. Fantastic Fiction has writing prompts in it. It also has tips on how to write well-organized works of fiction. But it is so much more than that. This is a complete 6-10 week creative writing unit. Everything a teacher or home schooling parent will need to guide their students toward writing their own original work of fiction. 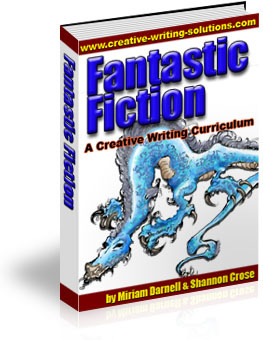 Fantastic Fiction takes students, grades 5-12, into the world of professional fiction writing, without the pressure of the publishing process. It offers teachers an easy program of lecture, discussion, and activities that engages the interest of students at a high level. It is a step-by-step guide to writing an emotionally impacting story, filled with techniques, such as style and voice, that even 5th graders can easily understand. One of the best things about Fantastic Fiction is that it has the wonderful side effect of turning young, average writers into great fiction authors as well as outstanding critical readers. This creative writing lesson plan improves critical reading skills and gives students an improved ability to analyze the masterful writing techniques used by famous authors. When they finish the lesson plan, many students are better able to understand what they've read and engage in intelligent, thoughtful discussions about the author they are studying. This is a must-have creative writing curriculum for any language arts teacher. Make room on the shelf for one more essential book! Here is a listing of the Table of Contents. We have posted some parts on this website to give you an idea of what is included. This curriculum is meant to be a complete resource for teachers who want to present a creative writing unit. We've included all the information needed to guide your students from start to finish. Many students have no idea how to begin their story. Just as many have no idea what to write about or how to develop the ideas they do have. Fantastic Fiction has everything a teacher needs to get students over these obstacles and on to completing their first short story or chapter in a novel. Included in the curriculum is an article for the students on character point of view. Written at the student level, this article explains many point of view definitions such as first, second and third person, third person limited, third person omniscient and third person objective. All concepts are explained in easy to understand terms with examples. Cost for this full color book: $34.25 including postage. Please allow 2-4 weeks for delivery and remember to include your full name and address on your PayPal order. © 2005, All Rights Reserved, Druidawn, Inc.